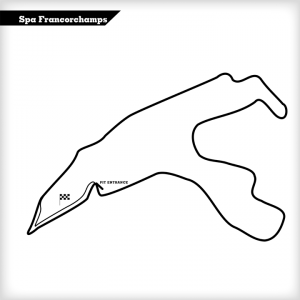 There are 2 pitlanes in use currently, the GP pits (detailed in the map above) & the endurance pits (entry after the GP exit, and exit onto the start of Kemmel). A lap starting from the GP exit goes down towards Eau Rouge and Raidillon. The trick is to go as close to the wall as you can, and stay there. Then, you cross to the left, over the big patch of curbstone. You straighten the wheel again and brake as you see fit. After the braking, and when you’ve started the climb of Raidillon, you turn right. Not too early! You want to go up in a straight line and apply lots of throttle for the long straight line ahead (Kemmel). 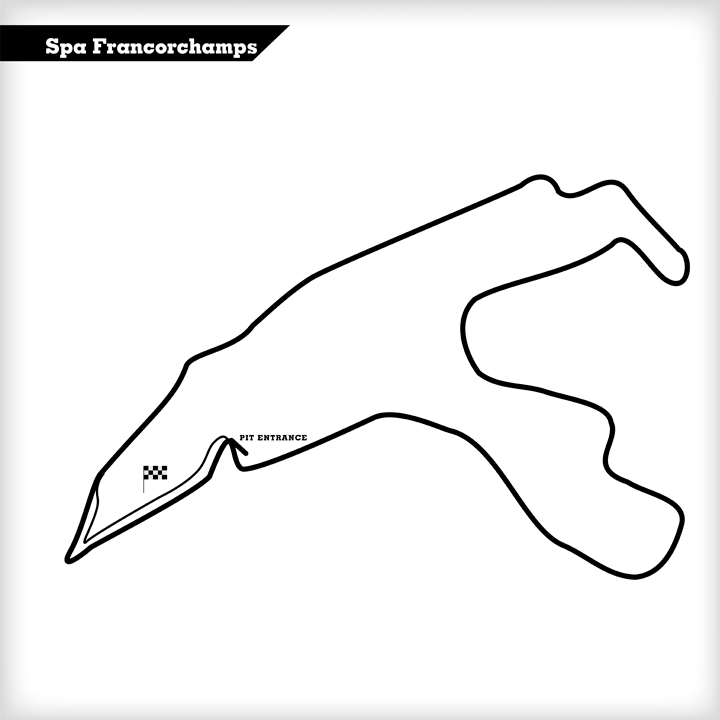 Next up, Les Combes, heavy braking at about 100 metres. Make progress during the day, adjust the braking point as you see fit. Late entry into the first right hander, stick to the middle on the exit and flick it left. The curbstones are accessible in these few corners. As you exit, again, stay in the middle of the circuit and go to the left hand side of the track to flick it right through this third and fastest corner of Les Combes. In the dry you can use the curb on the exit. Bruxelles is the next 180 degrees right hander. Start braking when the curbstone on the left starts. Keep to the outside on the entry, go for the apex halfway through. Aim for the manhole cover on the inside. All the way back to the left on the exit and cross to the right straight away. Short braking zone and early in to the left hand 90 degree corner, called ‘Speakers corner’ (it is the only corner the circuit speaker can see through the forest from his cabin). Then comes the descend to the Double Gauche. A very fast double left hander, equally satisfying as Eau Rouge in my opinion. Medium braking and fairly late in to the corner. You don’t want to end up on the AstroTurf as you exit. You want to make one big corner out of these two. You can be flat out through the second one, but don’t go to the apex too early, because it will compromise your exit. Cross the circuit to the left, then short but heavy braking. Aim for a late apex in this right hander, set yourself up for the left hander that is the second part of this flowing chicane. Keep to the right as you exit and flick it to the left straight away. Clinch the apex and back to the right on the exit, in the dry you can go onto the curb. Cross to the left straight away for the next double right hander. Again short but heavy braking and flick it in, apex in the middle of the corner. As you exit (in the dry) go onto the outside curb, stay there! The ideal line for the next right hander starts with being on the outside curb, which will keep going in between these two right corners. A tap on the brakes, a short lift, flat out (depending on the car) and in to the corner. The apex is at the end of green curbing on the inside. You’re now blasting towards Blanchimont! Try and make your trajectory as short as possible through the first left kink (no lift necessary) and make sure you’re as much to the right as possible for Blanchimont. Some braking or a lift will be needed here. Start slow and build it up as it is quite an impressive bend. When you’ve survived Blanchimont, you’re heading towards the Chicane. Start with heavy braking just before 100 metres and brake later and later during the day as your confidence grows. You can trailbrake as you enter the first tight right hander, stay right on the exit for the next tight left hander and on the throttle for the start/finish straight. Just La Source left now. Brake in between 100 and 50 metres, take loads of the inside curb, the apex is pretty late, so that you can start accelerating early for the descent towards Raidillon. If your pants are still dry, go for another lap!